En zoals dat gaat bij concept cars er is van alles mogelijk. Ben benieuwd of Faraday Future er in gaat slagen om in 2017 een volledig elektrische auto op de markt te brengen die wel te koop zal zijn en in hoeverre al het moois dat nu wordt gepresenteerd met de FFZERO1 concept ook terug te vinden is in die elektrische supercar. We blijven Faraday Future met belangstelling volgen op hun weg naar die productieversie van een ongetwijfeld mooie elektrische auto. De verschillende video‘s zijn in elk geval mooi en zeker de moeite waard om even te bekijken. FFZERO1 Concept is a Car of Concepts, an amplified version of the design and engineering philosophies informing FF’s forthcoming production vehicles,” said Richard Kim, head of design, Faraday Future. User-centric design is core to Faraday Future’s product development approach. Like future production models, the FFZERO1 Concept has a sixth sense for its drivers’ needs: featuring adaptive personalization, seamless transfer of custom vehicle configurations, access to live images and real time data visualization. Another of Faradays Future’s core philosophies is to design from the inside out. The FFZERO1 Concept’s interior is primarily white with a carbon fiber finish – a pure and extremely clean aesthetic atypical for combustion engine race cars, but reflective of a clean, quiet electric vehicle. Inspired by NASA research, the single-seat configuration offers a comfortable, weightless body position, holding the driver at a perfect 45-degree angle, thereby helping to promote circulation. The propeller-shaped, asymmetric instrument panel is a theme that will be incorporated into the future Faradays Future design DNA. The panel runs seamlessly into a unique Halo Safety System with integrated head and neck support, oxygen, and water supply fed to the driver through a prototype helmet. The system could also gather biometric data about its driver. Utilizing lightweight materials and composites on the VPA platform, the Faradays Future design team experimented with new driver-focused proportions, pushing the canopy forward for a perfectly aerodynamic teardrop profile. Faradays Future’s soon-to-be signature UFO line runs around the center of the vehicle and is intended to give the sense that this vehicle is not completely of this world. Aero tunnels run through the interior length of the vehicle, allowing air to flow through the car rather than around it, dramatically reducing drag and improving battery cooling. Featuring four motors, one at each wheel, FFZERO1 Concept is built for its use case: the track. If developed for limited production, it will have more than 1000 horsepower and will accelerate from zero to 60 in under three seconds, with a top speed in excess of 200 miles per hour. Since its inception 18 months ago, Faraday Future’s team of multidisciplinary experts from the technology, automotive, aerospace and digital content fields has dedicated itself to not only building the next generation of safe, reliable, high-quality electric vehicles, but also to creating an entirely new vision for mobility. In doing so, many design and engineering team members were encouraged to sketch out additional possibilities. One drawing of a high- performance racecar particularly intrigued Nick Sampson, who suggested building it on the VPA as a proving ground for Faradays Future’s design and engineering concepts. 21 november 2015; De Amerikaans-Chinese startup Faraday Future is vastbesloten om binnenkort een aantal elektrische wagens op de markt te brengen. Faraday Future heeft nu aangekondigd dat het z’n eerste concept zal voorstellen op 4 januari 2016, op de CES technologiebeurs in Las Vegas. The Verge ging op bezoek bij Faraday Future en sprak er met Nick Sampson (Sr. Vice President) en Richard Kim (Head of Design). Kim was de hoofddesigner van de BMW i8 en i3. Sampson was verantwoordelijk voor het chassisontwerp van de Tesla Model S. Allebei hotshots dus wat hoge verwachtingen schept voor het design van de eerste Faraday Future. In 2017 wil Faraday Future z’n eerste elektrische auto introduceren. De concept die in januari wordt voorgesteld zal dus allicht de voorbode zijn van hun eerste wagen. Zie Faraday Future: What if? What if there was an electric car that not only helped preserve the environment — it actually made us look forward to the daily commute? What if such a car could redefine our relationship with the automobile itself? Our new short film — ‘What if?’ — explores the cleaner, better world we’re building at Faraday Future, and the big questions that drive us. Experience Faraday Future’s FFZERO1 Concept from the driver’s seat through an immersive, interactive 360 degree video. Explore Faraday Future’s revolutionary Variable Platform Architecture – an innovation that can allow for a diverse fleet of highly customized electric vehicles to be built around a single, universal core architecture. Back in late twenty fifteen, California startup Faraday Future announced its intent to build a massive $1 billion factory in the Nevada desert north of Las Vegas. It would, the company promised, be the place where it would produce multiple electric cars with performance, range and specifications to match Tesla’s Model S and Model X. It even managed to gain $335 million in tax relief and abatements form the Nevada State legislature to help secure the deal. But while Faraday Future had promised its factory would be well under construction by the start of Spring 2017, little more has happened than ground works. So where’s the factory, and what’s next for the Chinese-backed firm? Faraday Future has taken another turn for the worse as the automaker announced it was abandoning plans for a production facility in North Las Vegas, Nevada. The road to the top is full of surprises. Presenting the full story of our test of the thermal limits of FF 91 at the Pikes Peak International Hill Climb. The new facility is in Hanford, California – roughly halfway between Los Angeles, where Faraday Future is based, and Silicon Valley. Is The Electric Car Company Doomed? 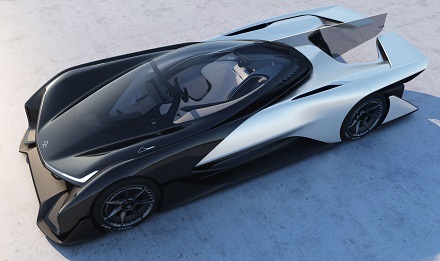 Back at the tail end of twenty fifteen, Chinese-backed California startup Faraday Futures exited stealth mode with a bold goal: to build a new type of electric car that embraced modular drivetrain design, was full to the brim with the latest technology, was built with carsharing and ridesharing in mind, and could beat Tesla in the plug-in marketplace. Its first car, unveiled at CES 2016, was a never-to-make-production single seat concept car. Its second, the FF-91, was a four-seat high-performance luxury SUV that it said would enter into production by 2018 and built at a state of the art facility just north of Las Vegas, Nevada. That facility, which the state of Nevada had offered Faraday Future more than $335 million in incentives and abatements to secure its construction in the state, was to be constructed during twenty sixteen and twenty seventeen, with production starting ahead of an official 2018 launch. However, financial problems plagued the company, with creditors taking the company to court and the firm’s principal backer suffering financial problems of his own. Combined, these issues slowed down Faraday Future’s plans and ultimately, its chances of succeeding in the plug-in marketplace. A seemingly final nail in the coffin, Faraday Future ended its Nevadan story completely (at least for now) last week by writing the state of Nevada a cheque for the incentive money it had already taken, ensuring the state was not out of pocket. Instead, it began planning a production facility in California, built at a leased facility using a secured loan taken out against the company headquarters. Which leads us to ask one simple question. Is Faraday Future doomed? And is it on death watch? Past, present, and future are worth celebrating. Every move forward, no matter how big or small, is meaningful. Take a step back and embrace the moment.